The Blair Chiropractic Society selects to honor individuals who attempt to improve the health and wellness of mankind. Often these people serve mankind by paving new pathways and advancing the science, art and philosophy of chiropractic. Greg Buchanan has awakened a large segment of society to the concept that injuries to the uppermost vertebra in the neck can dramatically damage people physically and emotionally. The Blair society recognizes that all individuals are formed differently and therefore precise spinal adjustments to the upper neck must coincide with the individual's anatomy in order to produce lasting changes in a person's health. Greg is extremely knowledgeable in regards to anatomy, neurology, orthopaedics, pathology, and research. His website is packed with important research on the upper neck and ways to regain your health, description of the various upper cervical techniques and a great database of practitioners Worldwide. 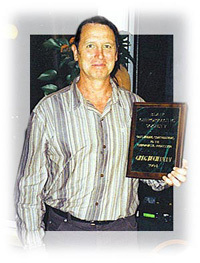 As a result of his many contributions to Upper Cervical Chiropractic since his injury in 1997, a special award was presented at the October 2004 Blair Chiropractic Society Convention to Mr. Greg Buchanan for his "Outstanding Contributions to Chiropractic by the Blair Chiropractic Society." Gregs presentation to Blair Chiropractors at the conference was of a highly professional standard and as a result he was given a standing ovation. The awards ceremony at the end of the conference was an emotional affair for all involved as tears flowed freely when Greg was given this well deserved award. Greg explained afterwards that he was so choked up because he did not expect to receive such recognition. He does what he does because he knows that the upper cervical chiropractic approach is "the single most important and powerful health approach in history". He says that his reward for his work comes when he sees people who are ill get well again. He is especially gratified when sick children who have been so for years become well again. He is very disappointed that allopathic medicine in the main does not choose to work with chiropractors. He wishes to thank the upper cervical chiropractic World for saving his life and feels indebted to it forever.